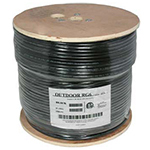 Our RG-6 Bulk Coaxial Cable is TAA and RoHS compliant. The conductor 18 AWG and includes Copper Clad Steel. It is insulated with Gas Injected Foam PE, shielded with AL-MYLAR, and braided with Alluminum wire. This RG-6 cable is perfect for residental and commercial applications which include professional video applications carrying either baseband analog video signals for serial digital interface (SDI) signals. This RG-6 Coaxial Cable is usally used for CATV distribution and utilized F connectors, BNC connectors.